Tupelo’s a Honey! | Oh, the Places We See . 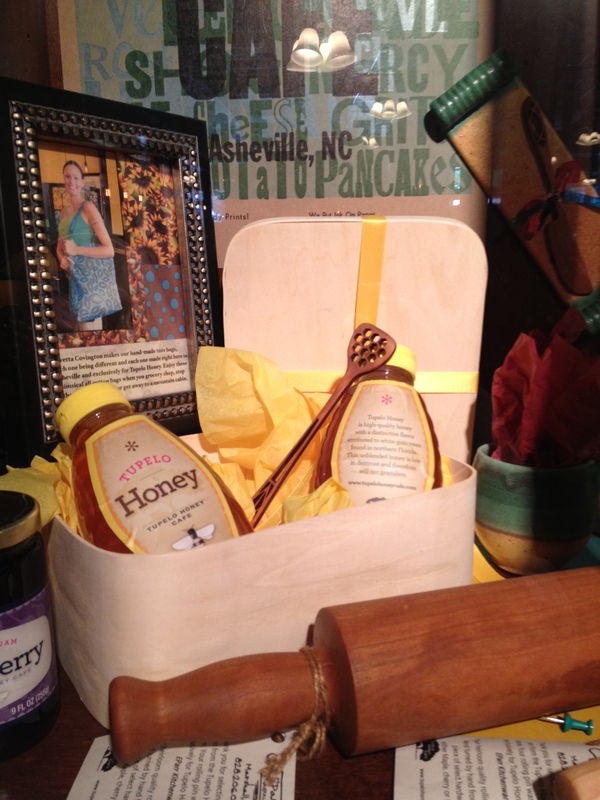 . .
We had seen the Tupelo Honey Cafe booth at both the Dogwood Arts Festival and the International Biscuit Festival. And we’d seen workmen gutting the old Soup Kitchen right around the corner from The Oliver Hotel in downtown Knoxville, getting ready for Tupelo to arrive. But we still didn’t know what all the hoopla was about. The pimento cheese biscuits at Biscuit Fest looked mighty fine. So did the charming yellow cookbook. But still. What’s comin’ to Knoxville that has so many people (like us) signing up for a Shoo Mercy Club card at a festival booth in anticipation of a restaurant they don’t even know about? So, we decided to do a little restaurant research. (Twist our arms!) 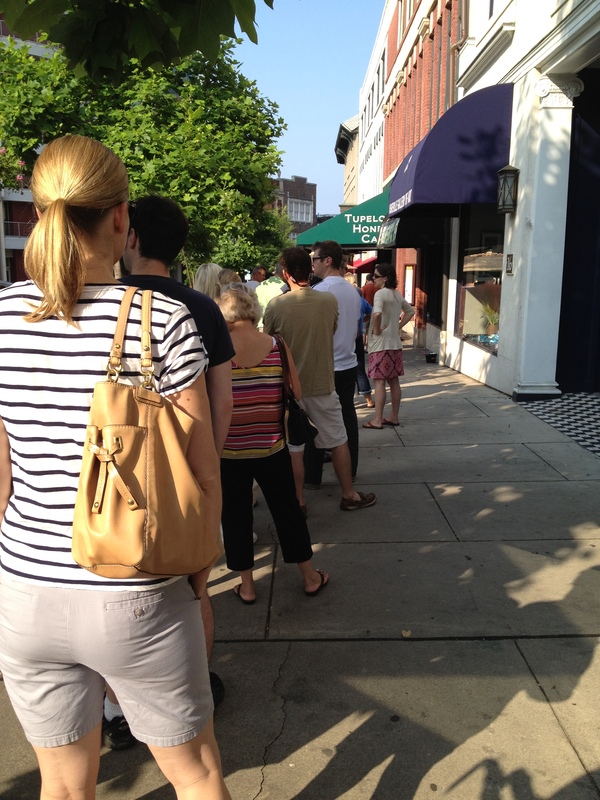 On Memorial Day weekend, we lined up for Sunday Brunch at the Tupelo Honey Cafe in downtown Asheville, North Carolina — and it’s a good thing we arrived early . . . and hungry! We worried that we would be the first folks for the second seating. But as luck would have it, we were seated at the bar — right where we could see the action and enjoy the first round. And action there was! 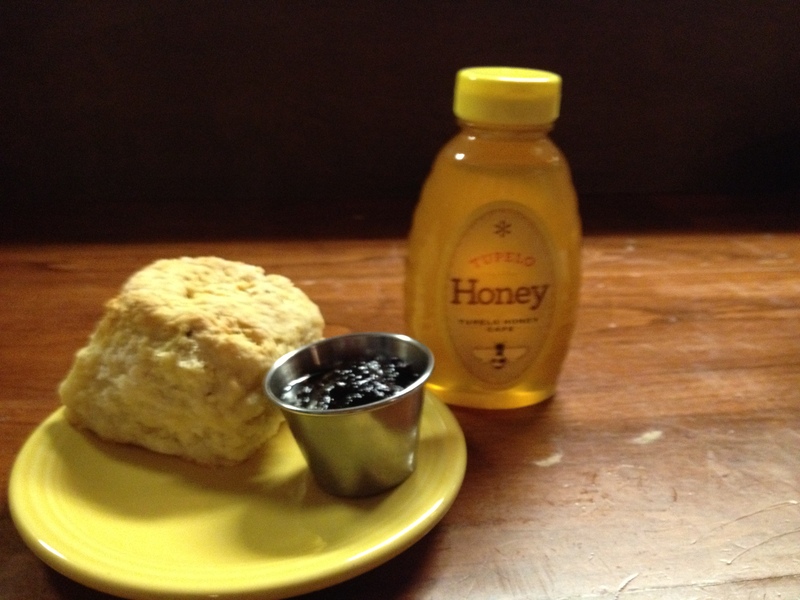 Right as we sat down, Claude, our waiter, brought out the fluffiest, soft-dough, crusty top biscuits we’ve had in a long time with Tupelo‘s signature honey and a little cup of blueberry preserves! Oh, my! Claude reaches for hot biscuits and tupelo honey. While we were filling up — and this was before we placed our order! 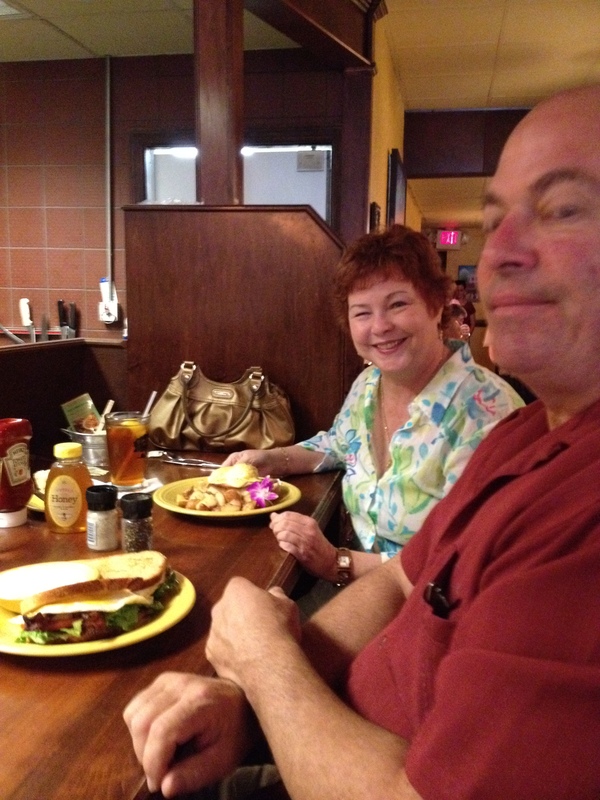 — our bar mates Pat and Sonya Springer from Brazelton, Georgia, told us what they had ordered. 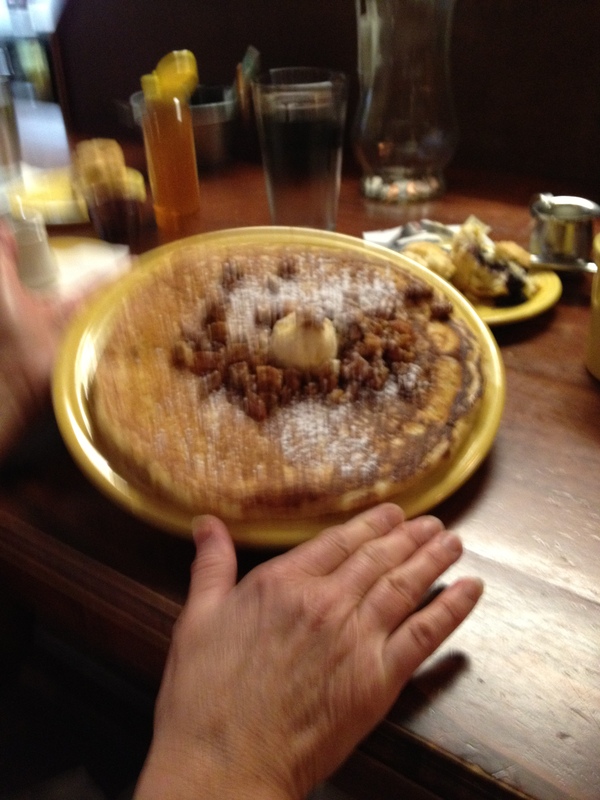 Pat chose the Sweet Potato Pancake “flavored with cinnamon and sweet potatoes, topped with whipped peach butter and spiced pecans”! It covered the whole plate! It’s what Tupelo is known for: traditional Southern cooking with farm fresh food from local vendors, but paired in non-traditional ways. Southern Surprise, I call it! 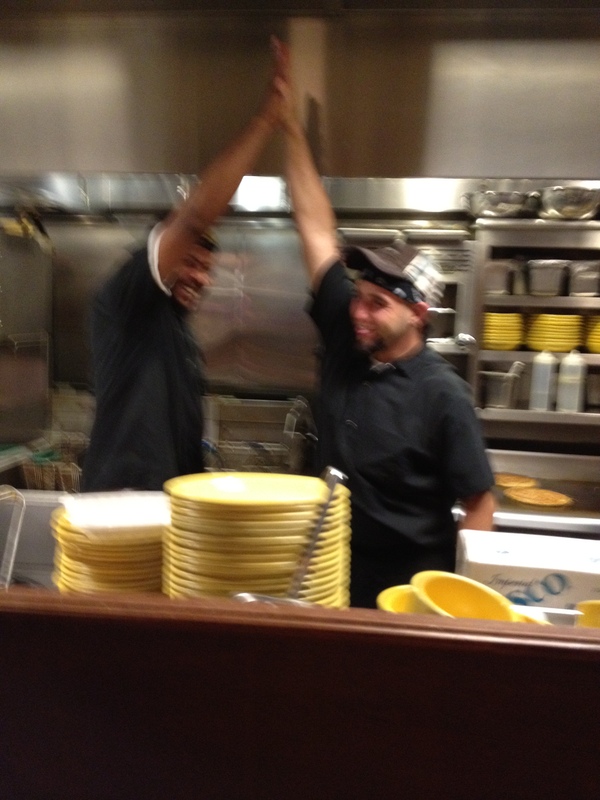 Claude went into the kitchen area to snap this picture of Nick flipping pancakes! A pizza peel might have been a better tool than a pancake turner — these are no ordinary pancakes! One’ll do you, for sure! 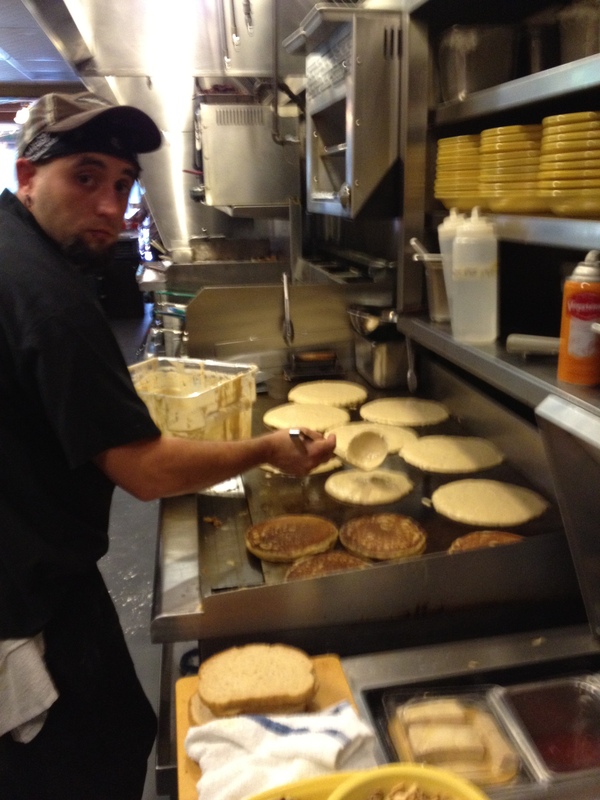 Nick, super Tupelo pancake flipper! 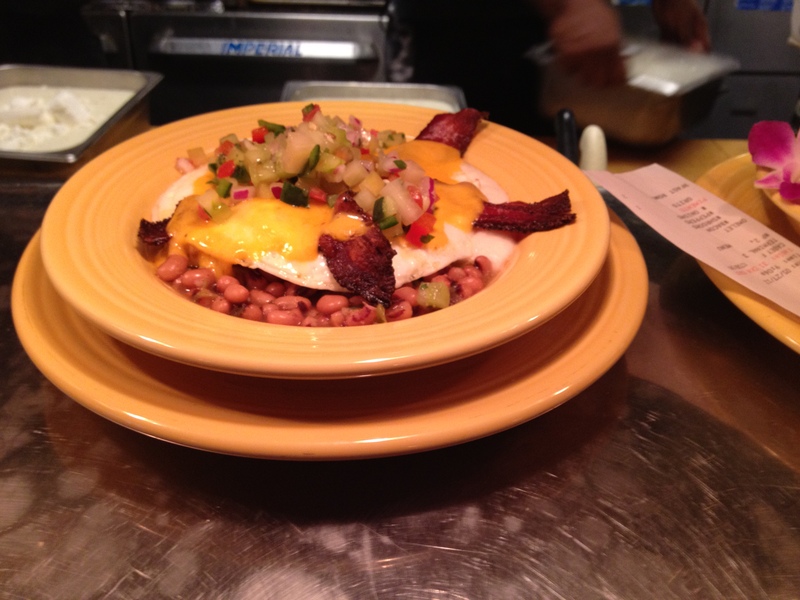 Bert liked the blend of flavors — black-eyed peas, eggs, salsa. Definitely not like breakfast at home! And he barely made it to the bottom. Sooooo much food! But sooooo good! 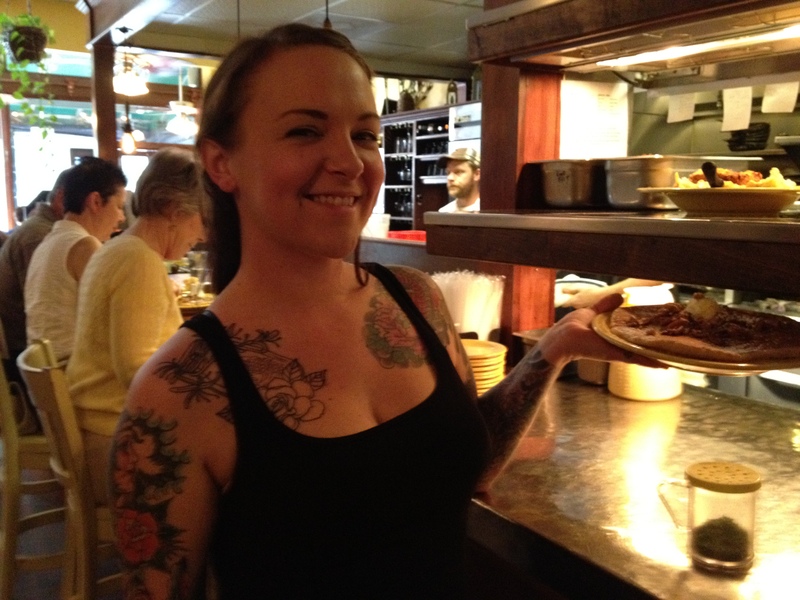 Something else to praise about Tupelo Honey Cafe are the servers like Kenzie who wanted me to see her honey tattoo! She’s been there two years and still loves serving guests at Tupelo! We decided it would be of some benefit to be young if you worked there. Waiters were literally running to grab hot plates from under the lights . . .
Kenzie, the girl with the honey tattoo! or ladle out heaps of simmerin’ black-eyed peas for the Breakfast Bowl. Quality production. Immediate service. With a little chatter and fun mixed in! Nikita ladles black-eyed peas for the Breakfast Bowl! Feeding an entire restaurant full of first-round diners was something akin to making a banquet happen, except that food was prepared one order at a time! When the rush subsided, I snapped a picture of Nikita and Nick high fivin’ each other — heck, they almost hugged! The breakfast whoosh went off without a hitch, and every guest we saw was leaning back, happy, as they took their final sips of well-brewed coffee. Ah, Southern satisfaction! Made it through the rush! And when you’ve had your fill, you can take something to the folks back home from Tupelo Honey — t-shirt, cookbook, raspberry preserves, or that golden, gooey, mighty tasty honey! 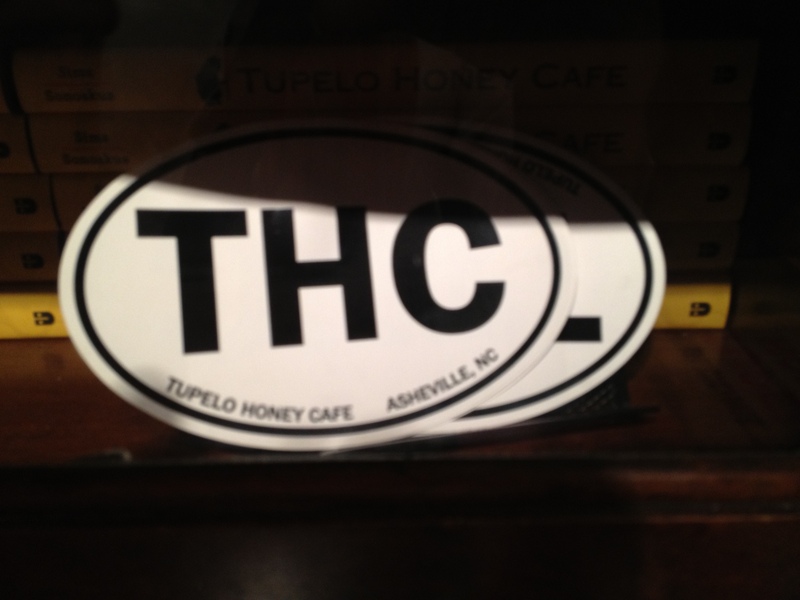 The first Tupelo Honey Cafe is downtown Asheville on College Street, but there’s a second one in South Asheville. We’ll have to go back to check that one out! If you go to their website, you can sign up for the Pimento Cheese of the Month Club, download a recipe, or link to their Facebook page! Meanwhile, we’re looking fondly at that Knoxville Market Square property. A long line out the door for Tupelo‘s new Southern comfort food — and not just breakfast — is gonna look mighty good in downtown Knoxville! As they say . . .
Tupelo‘s a honey, for sure! 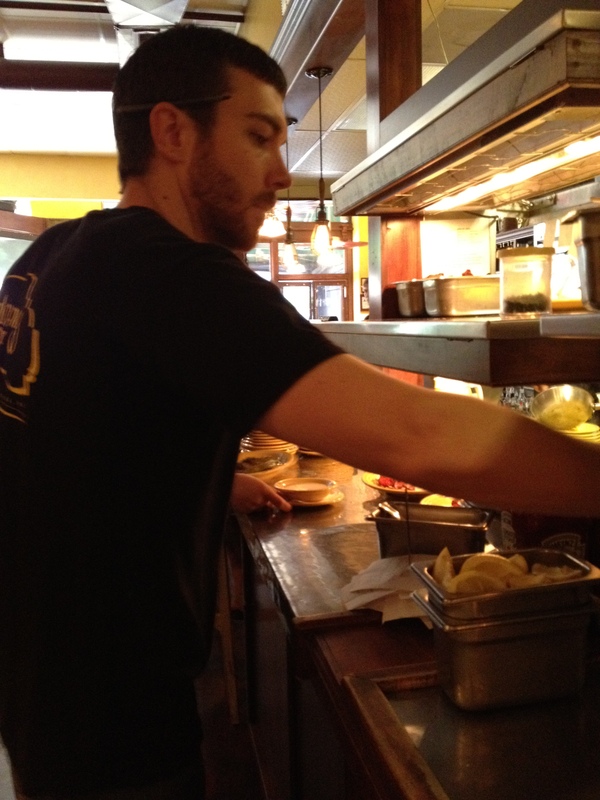 This entry was posted in Restaurant and tagged Asheville, restaurant, Southern food. Bookmark the permalink. 10 Responses to Tupelo’s a Honey! Thanks, Rusha, this really shows what the buzz is all about. They need to hurry up, already! Any news on when Tupelo is coming to Knoxville? I had heard August, but later heard September. Not sure! Pingback: Curate: Spanish Flair in Downtown Asheville | Oh, the Places We See . . .
Another restaurant we really like in Asheville is Table. Located, ironically, in the building where Tupelo Honey Cafe has its corporate office. I’m thinking another trip to Asheville has to be on my radar! Next time, try the Shrimp and Grits! Best we have ever tried, and we’ve tried them in a LOT of places! The next time you go, try the shrimp and grits. They are the BEST my husband and I have ever tried, and we have gotten them in a LOT of other restaurants! 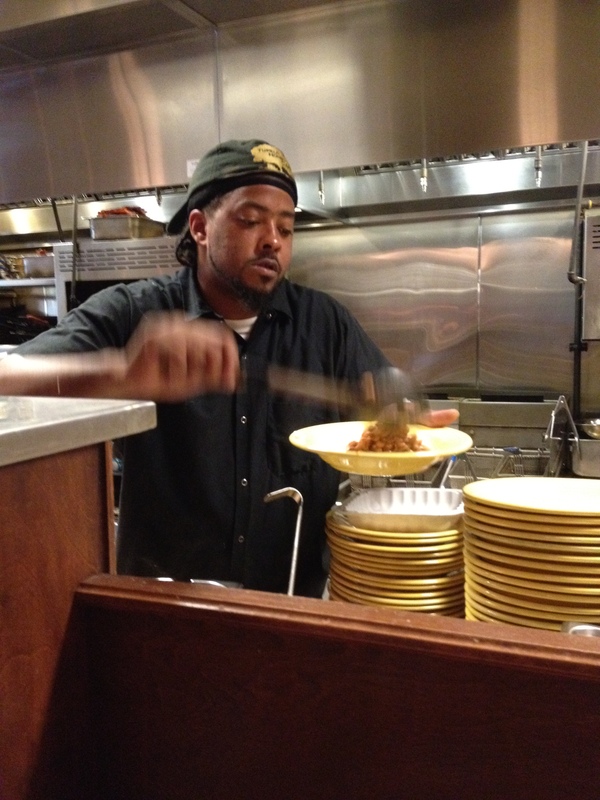 Some of the *other* places have won awards for their shrimp and grits, but Tupelo Honey’s are better. And I’m not kidding! Thanks for this recommendation! We haven’t tried Tupelo for lunch or dinner, so there’s another eating extravaganza in our future! Awesome review, Rusha! As you know (at least I think I told you! 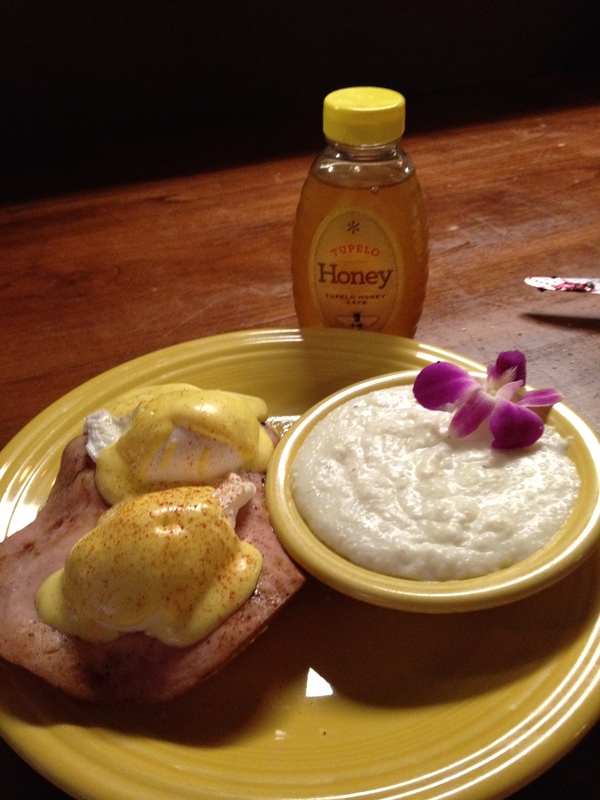 ), Moxley Carmichael is helping Tupelo Honey with the grand opening of its Knoxville restaurant. We are so excited about that great event, which will happen in September. We also went to Asheville on a “research project” recently and ate at both Tupelo Honey Cafes there. The one in South Asheville is in a former Stir Fry Cafe, a fact which I loved because Stir Fry was my favorite Knoxville restaurant before our friend Kenny, who owned it, passed away. I can’t wait to see more of you and Bert downtown after Tupelo Honey opens on Market Square! Thanks for your comments! I wish we could have gone to the Southside Tupelo’s, but so many restaurants, so little time! We decided to try Curate (post coming soon)! Also a winner! Really looking forward to trying lunches and dinners at Tupelo Knoxville! We know now that breakfast is bountiful!